The Nintendo Switch’s library continues to grow with release of 88 Heroes: 98 Heroes Edition. This is a special edition of the game 88 Heroes, released earlier this year for PS4, Xbox One and PC, that features 10 new characters and 8 additional levels. Being the first game from developer Bitmap Bureau, is awesome to see it getting the special edition treatment! Dr. H8 (Hate) has 88 nukes that he plans to unleash on the Earth on the 8th of August 1988 at 8:08 unless he is payed 88 octillion dollars. Earth called its heroes, but they are all mysteriously unavailable. It is now up to 88 of the most unlikely heroes to save the Earth from Dr. H8! No one knows why and should they even try? 88 Heroes: 98 Heroes Edition is a platformer that features 88 maze like levels that need to be completed in 88 minutes. Don't worry about this time limit too much, you should have no trouble beating the game in time. The beginning of each level will spawn you with a random hero of the available 98. Each levels requires you to navigate your current hero from a starting point, to an elevator. Along the way you will be dodging lasers, spikes, enemies and all sorts of other hazards. If and/or when your hero dies, you restart the current level with a new random hero of those left alive. This can be both a blessing or a curse depending on your next hero spawn. Each level has a time limit of 88 seconds that will start counting down as soon as you leave the starting area, so you need to move quickly if you want to finish in time. The game is broken up into 4 worlds with 22 levels each, all of which introduce new challenges. Levels range from easy to borderline frustrating, but getting the right hero spawn can finally make all the difference on a tough level. Since one heroes' abilities might be better for that particular level than another. The Heroes are the most interesting part of 88 Heroes: 98 Heroes Edition. Each new spawn introduced me to a completely new experience. My very first character was a bubble farting dinosaur! As I progressed through the game I got to meet many more absurd, useless and awesome characters. Remember the old Nokia snake game? Yeah that Snake is in this game and it’s just one of many pop culture references some of these characters are pulled from! Each heroes' abilities, or lack thereof, will factor into how you play each level. I quickly lost many of the more useless heroes in my playthroughs, so that each time I started a level I would have better chances of having a winner. Losing a good character can be devastating further into the game, but fear not! Collecting 88 of the coins scattered around the map will let you revive one of your fallen comrades. If you happen to lose all your heroes, you can select to continue the game but only the hero you last played as will be available to you. At this point you might want to reconsider starting a new game unless you find that last hero amazing. 88 Heroes: 98 Heroes Edition uses a pixel art graphics design, resembling the 16-bit era games from yesteryear. This art style is continually overused by many games today, but for 88 Heroes: 98 Heroes Edition it fits well into the games humor and settings. The whole game plays out from the perspective of Dr. H8’s lair as he watches your heroes attempt to navigate his deadly levels through his giant viewing monitor. 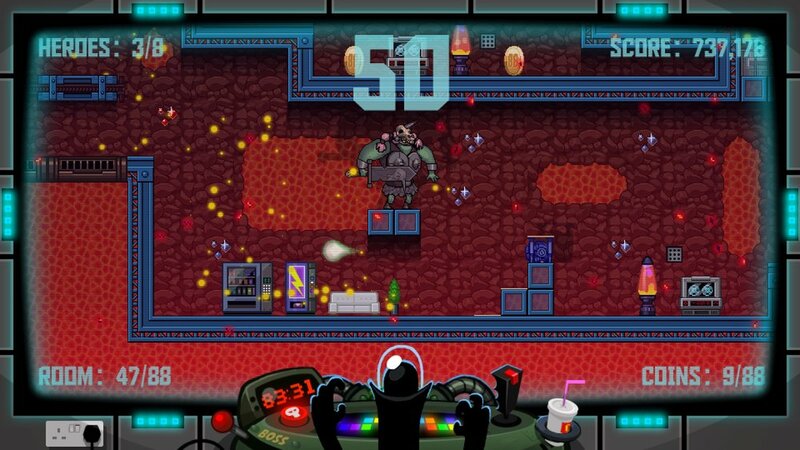 Dr. H8 and other random henchmen will occupy the bottom portion of the screen while action unfolds throughout. Each playthrough of 88 Heroes: 98 Heroes Edition always presents a slightly unique experience due to the randomness of hero selection. There is more to 88 heroes: 98 Heroes Edition then the regular 88 Mode however. The Magnificent 8 mode becomes available after you play the game your first time. In this mode you get to choose a team of any 8 heroes to tackle the game providing a more refined experience. After playing through The Magnificent 8 you unlock Solo Mode which lets you play the game as a single hero. If you are looking for more of a challenge, H8 mode is ready to provide you with extra punishment. Anyone looking to get the most out of their purchase should have no trouble finding ways to spend time. At times, Dr. H8 and his minions will obscure your screen, making the experience feel cheap instead of challenging. With how challenging the game can already get, this inclusion of false difficulty is a bit of a turn off for some. Dr. H8 also doesn’t have many dialogue options. Having a hero die or beating a level will often result in hearing the same line of dialogue multiple times, which you can believe gets monotonous. Finally, the sheer number of useless and counterproductive heroes could have been slightly more refined. While a silly hero here and there is humorous and can add to the difficulty, I felt there were far more than can be justified. 88 Heroes: 98 Heroes Edition is a unique experience. The randomness of, "What hero I will I get next? ", kept me entertained for a couple playthroughs. Modes like The Magnificent 8, Solo and H8 also bring tons of content and replay-ability. Unfortunately, the nuisances of false difficulty, annoying dialogue and number of useless heroes give me a slight pause on immediately recommending 88 Heroes: 98 Heroes Edition to Switch owners. Especially at the current asking price of $29.99. Although, I can totally see this game becoming a big deal among challenge players and the speed running community. If you are not 100% sold on this game, then wait for this one to go on sale.